Here’s a problem from a brother (in Canada) who does dawah online – A Christian wrote to him who attacked Quran with little or no knowledge of Quran (or Bible for that matter). Here is my honest explanation of why I do not believe the Qur’an but I do believe the Bible. First reason I do not find the Qur’an credible is that it was “revealed” to one man who’s philosophy changed radically from the beginning of his “revelation” to the end. After he got a big following to build an army, he stopped preaching peace and started preaching conquest by force. I’m very sorry to sound insulting, and I don’t mean to be personally offensive, but from my perspective Mohammed appears to be a schizophrenic (goes away to a cave to hear voices no one else can hear) with an ever mounting paranoia and messiah complex on the same order as Adolph Hitler. I know that could sound harsh, but I don’t think there’s any way to state that opinion honestly without sounding a bit rude. Now the Bible, was revealed to many many authors over the course of thousands of years. Reading it from cover to cover shows us that God is willing to do whatever it takes to build a relationship with us. In the beginning of the Bible God commands the Jews to conquer their enemies and those in opposition to His sovereignty, but there is firm evidence that violent overthrow of societies does not draw people to God. He clearly demonstrates throughout the course of the historical books that violence is NOT the way to bring people to an understanding of himself. Consistently throughout the Bible God shows us that the punishment for our sinfulness is death, and he ALWAYS provides a satisfactory solution to this problem without us having to take the punishment. The Quran says that Abraham took Ishmael to mountain top, and the Torah says he was to sacrifice Isaac, but the point of both stories is that a sacrifice is required. God made a provision yet again so that we can remain in relationship with him. Why? Because in spite of our sinfulness, in spite of the fact that we don’t deserve a relationship with Him, God LOVES us. He’s willing to go even to the point of SELF-SACRIFICE to be with us for eternity. 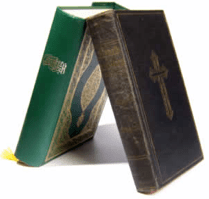 – Now have you ever looked at the Koran in chronological order? Have you ever looked at Mohammed as a person rather than a prophet? What evidence does he give that he is credible beyond the fact that he led many armies in violent conquest? Jesus consistently demonstrated peace. He never led an army or harmed a single person. He went to the cross in silent sacrifice. He consistently taught that our relationship with God is evident in our treatment of the people around us. Jesus consistently taught that we need to be humbly aware of our shortcomings and able to forgive and love those around us for their shortcomings. Jesus taught us that we will be known as his followers if we love one another. He taught us to be gracious just as God is gracious. He performed miracles witnessed by hundreds that did no harm to anyone and demonstrated God’s good will towards us. Most importantly, He died and came back to life to demonstrate God’s forgiveness and that even death cannot conquer God. Which of these men demonstrate an understanding of the one true God who desires peace for his people. I can’t speak for you, but I choose Jesus. PS: Actully I only read some of the Koran and Bible before I accepted Jesus. I read some parts of Quran, but mostly books on religion and history before coming to Christ. I’m waiting for you reply, please reply me as soon as possible & come to Jesus. Thank you for your kind letter and for you encouraging words. Certainly this is most appreciated and goes quite a long way with us. Regarding the letter you attached from the “Christian” – let me say that this is a very deep subject and not one for a single email. But I can give you a brief insight as to what I might do in a similar situation. First, I do not like it when someone pretends to be ‘hesitating‘ to say something at first, but as you read on they don’t hestiate at all, even by comparing our beloved prophet, peace be upon him, to Adolf Hitler. This is absolutely uncalled for and inappropriate. We know the Qur’an (Recitation of Allah) is exactly preserved and memorized as it was during the lifetime of the holy prophet, peace be upon him. This cannot be disputed because we have over 20 million who have memorized the entire Quran from cover to cover, word for word, all around the world and any one of them can bring it back just as it was at the time of the prophet, peace be upon him. Every Muslim in the world (over 1.5 billion) knows at least portions in the Arabic language, although 88% are not even Arabs. On the other hand, Bible scholars themselves know that nothing of the original words, letters or even original copies of the Old or the New Testament exist anymore. Nothin in the original form either in memory or written text exists anywhere on the earth, nor has it existed as such for at least 1,500 or more years. 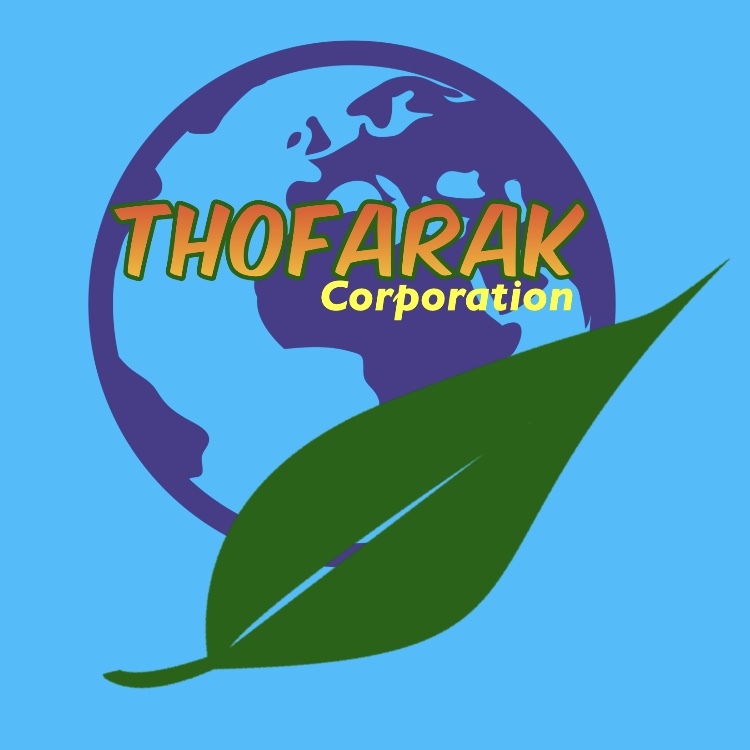 Interesting enough, the Qur’an does claim the original Bible was from the exact same source (Almighty God) and it (The Qur’an) is merely bringing back to us the original message that came with all the prophets from Adam to Jesus (peace be upon them all) – the message of “No God beside God” (Arabic: Laa elaha illalah). The teachings of Islam from the Quran and the hadeeth of Muhammad, peace be upon him, are very clear and available in the original texts in Arabic for whomsoever would like to read them. There are no “hidden” books (called ‘apocrapha‘ by the Catholics) or ‘alternate readings‘ of older, ‘more authentic‘ manuscripts (see: Revised Standard Version of Bible, introduction. *Original Text – means the actual text written down or recorded by or under the supervision of, the originator; as in: The Moses did not write what is in the “Books of Moses” because the last paragraph of Deuteronomy tells us Moses died and was buried. The Quran was both memorized by companions of the prophet Muhammad, peace be upon him, and it was written down by his companions in books still remaining today in museums. 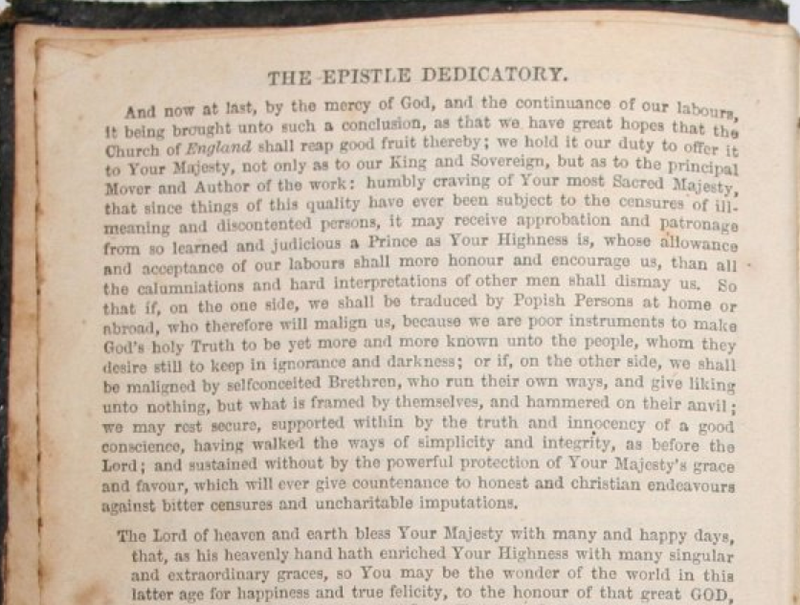 And now at last, by the mercy of god, and the continuance of our labors, it being brought unto such a conclusion, as that we have great hopes that the Church of England shall reap good fruit thereby; we hold our duty to offer it to your Majesty, not only as to our King and Sovereign, but as to the principal Mover and Author of the work: humbly craving of Your most Sacred Majesty, that since things of this quality have ever been subject to the censures of ill-meaning and discontented person, it may receive approbation and patronage from so learned and judicious a Prince as Your Highness is, whose allowance and acceptance of our labors shall more honor and encourage us, than all the calumniations and hard interpretations of other men shall dismay us. So that if, on the one side, we shall be traduced by Popish Persons at home or abroad, who therefore will malign us, because we are poor instruments to make God’s holy Truth to be yet more and more known unto the people, whom they desire still to keep in ignorance and darkness; or if, on the other side, we shall be maligned by self conceited Brethren, who run their own ways, and give liking unto nothing, but what is framed by themselves, and hammered on their anvil; we may rest secure, supported within by the truth and innocency of a good conscience, having walked the ways of simplicity and integrity, as before the Lord; and sustained without by the powerful protection of Your Majesty’s grace and favor, which will ever give countenance to honest and christian endeavors against bitter censures and uncharitable imputations. Chapter 1 – Is King James Version the Actual Bible? Chapter 2 – Are There Contradictions in the Bible? Chapter 3 – Who is the God of the Bible? Chapter 4 – Does the Bible Say ‘Jesus is God’? Chapter 5 – What Does This Prove? Chapter 6 – What To Do Now? After reading them both (entirely) take some time to read again the letter of the person and then think for yourself what he said in the closing remarks. He admits not having read either one of the Bible or the Quran – before he made up his mind. So his decision is based on bias and prejudice (pre-judgement) and he is not on any guidance from God Almighty Allah. This is even more obvious when you consider he wants us to reorder the surahs and ayahs in the Quran according to how he thinks they should be. We know from 1,400 years of recorded scholarly work, all of the hadeeth and Quran have been preserved and who originally heard everything, memorized it, wrote it down and to whom they transmitted it. We know when these people were born, where, how long they lived and where they died. This is totally absurd and out of context with the way Qur’an is revealed. The way Quran is assembled is not from Muhammad, peace be upon him, it is from Alllah. Therefore, the argument about placing them in an ascending or descending order is totally illogical. What next? Will he ask us to put them in alphabetical order? Or in order of the Arabic letters (alief, laam, meem, etc.)? This is nothing but nonsense. Consider the Bible as regards order of revelation, and then think again about this silly idea. According to scholars of the Bible, the Book of Job (we call him Ayyoob) is probably the oldest of all books in the Old Testament. Yet it is almost in the middle of what they have today. Then according New Testament scholars, the Book of Mark is actually than the Book of Matthew, the book before it. The statement about the Bible being “revealed” to many different authors is quite incorrect. It came directly to the prophets, peace be upon them all, and to none others. The people after them lost some (see:Bible reference to loosing the texts of Moses in the Arch of the Covenant during the Babylonian exile) and changing and ignoring some (see: Matthew 5:17, 18 Jesus claims Pharisees are not following the original Law (Torah). Then come to the very clear problems of the contradictions and errors in the Bible (see our website www.IslamCode.com and compare to the Qur’an wherein there is not a single contradiction. And the saying of Allah in the beginning of Surah Baqarah, “This is the Book wherein there is no doubt.” (Baqarah, chapter 2, verse 2). The Qur’an is memorized today by over ten million (10,000,000) living human beings, in the original text and in the original language. There are more than a billion distributed around the world in written form – and each is exactly like the other. There are no versions of the Qur’an. 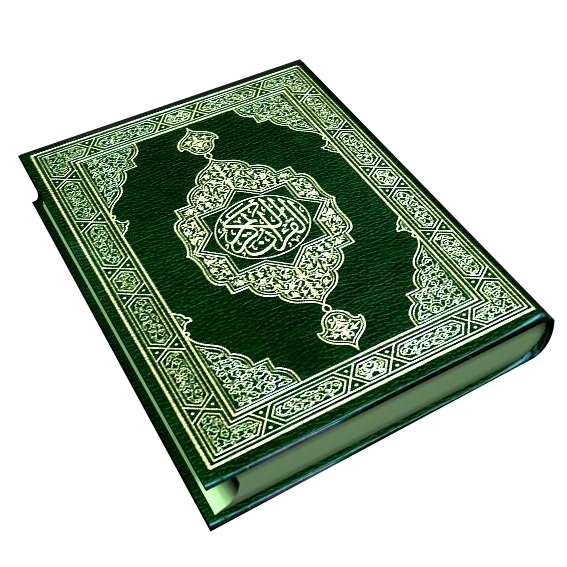 Ever single Muslim has memorized at least some portion of the Qur’an in the original Arabic language. Come let us compare these statements to any other religious book – or any book at allfor that matter and tell us what you find. Unless and until a person cleans their heart from biases and prejudices, they will never be guided by Allah. This is not about your relationship with them. It is about their relationship with Allah. If they want truth – they need to pray directly to Allah and ask for it. But if they want misguidance – then let them pray to whatever they want – and they will be misguided. You should offer to share what we have and listen to what they have (in a sincere effort to understand their perspective). Then pray for them and for us to be guided by Allah.